That’s right – everyone’s still talking about Kim Kardashian’s Vogue cover, but this time there’s good news (for the haters at least!). Previously, Toofab.com exclusively reported that the April 2014 issue was a bestseller, reaching sales of over 500,000 copies. While this is great news for Vogue, it turns out that those numbers were wrong. 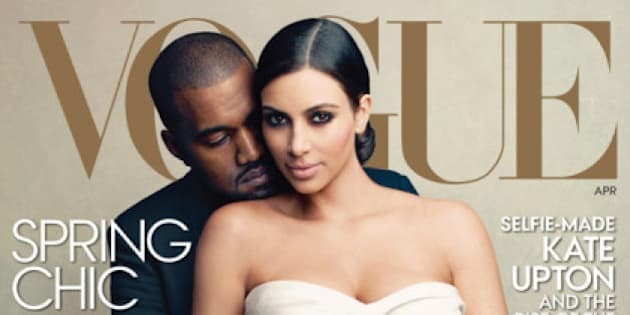 According to The New York Post, the Kim Kardashian and Kanye West Vogue cover only reached sales of half that at 250,000 copies! Last month, estimates stated the controversial issue was on track to sell between 300,000 and 400,000 copies, easily outselling both Beyoncé's and Michelle Obama’s covers from March and April 2013. Those issues sold 355,000 and 269,000 copies respectively. So did the cover pay off? According to Gary, when the Kimye issue is compared to those previous in 2014 – Cate Blanchett, Lena Dunham, and Rihanna – sales rose 13.5 per cent. This compared to sales six months before shows an increase of 35 per cent, and over the last year an increase of 10 per cent. Overall, editor-in-chief Anna Wintour’s decision to feature Kimye on the cover made a positive impact on the magazine, despite incorrect (re: unrealistic) estimates. While the cover certainly stirred things up, Vogue should have known that it would take a lot more than controversy to dethrone Queen Bey and the First Lady from their titles as bestsellers to date.